Ballymena United manager David Jeffrey. Pic by Pacemaker. Glenavon and Ballymena United shared the spoils at Mourneview Park on an afternoon of few clearcut chances. Tom McDermott - a January arrival from Derry City - was handed his senior debut by United boss David Jeffrey. Simon Kelly’s header wide at the back post off a Bobby Burns corner-kick offered early evidence of the Glenavon set-piece threat. Leroy Millar came close to capping Fra McCaffrey’s strong approach play with a goal but his shot flashed wide of the far post from a tight angle. Millar then stepped in to block inside own penalty area and frustrate Mark Sykes after clever combination play to create the opening between Andrew Mitchell and Stephen Murray. 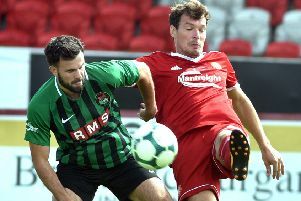 Kyle Owens fired a free-kick goalwards which forced Jonny Tuffey to push wide and, moments later, only Kelly’s presence prevented the Ballymena defender from then steering a shot towards the target. Jim Ervin produced a key block on the United line late in the first half to divert away Andy McGrory’s drive from outside the area. Glenavon had a massive penalty shout waved away early in the second half when Rhys Marshall’s ball into the box appeared to hit the hand of a Ballymena United player. Owens hit the heights to meet a Millar corner-kick but could not direct his attempt on target. Marshall then posed a threat off a Burns corner-kick but, once again, the attempt lacked direction and drifted wide. Stephen McAlorum was on hand to clear off the line after substitute Marc Griffin and Andrew Doyle both attacked a ball towards the back post. Mitchell then raced in to connect to Andy Hall’s delicious delivery but the striker was unable to divert inside the post. GLENAVON: Tuffey, Burns, Doyle, Kelly, Marshall, Mitchell, Sykes, Clingan (Daniels, 70), Murray (Griffin, 74), Cooper, McGrory (Hall, 60). Subs (not used): Marron, Norton. BALLYMENA UNITED: McDermott, Owens, Flynn, McAlorum (McKinney, 82), Braniff (McCloskey, 70), Shevlin, Balmer, Ervin, Millar, McCaffrey (Faulkner, 71), Quigley. Subs (not used): Glendining, Nolan.